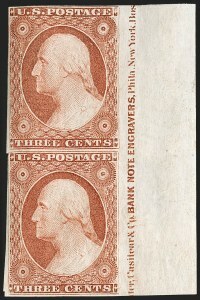 Frank S. Levi, Jr., recorded seven used strips of three of the imperforate 1¢ in which all stamps are Type Ia (see Bakers' U.S. Classics, page 188). There is no larger multiple of Type Ia positions. For the first 129 years of its existence, this block was part of a full pane of 100, which was owned in succession by Arthur Hind, Mortimer L. Neinken and Ryohei Ishikawa. 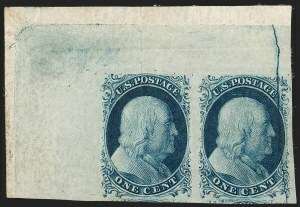 Soon after the 1980 Ishikawa 1¢ 1851-57 sale, the pane was cut into smaller blocks, including the Position 99R2 block that was resold to Ishikawa (see lot 15 in this Gross sale) and the plate block offered here. 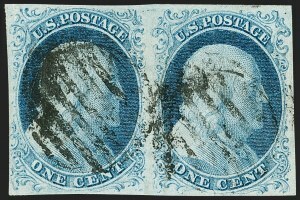 Many philatelists then and now regard the decimation of the Plate 2 pane as a wanton act of vandalism. 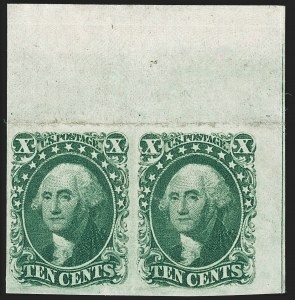 Magnificent corner-margin pair of 1¢ 1851 Imperforate with the striking Plate 2 "Big Flaw"
For the first 129 years of its existence, this block was part of a full pane of 100, which was owned in succession by Arthur Hind, Mortimer L. Neinken and Ryohei Ishikawa. 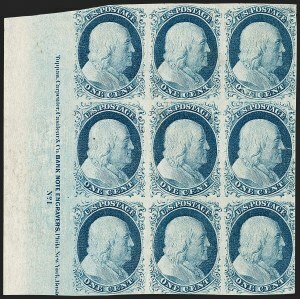 Soon after the 1980 Ishikawa 1¢ 1851-57 sale, the pane was cut into smaller blocks, including the plate block offered as lot 12 in this sale and this 99R2 block that was resold to Ishikawa. 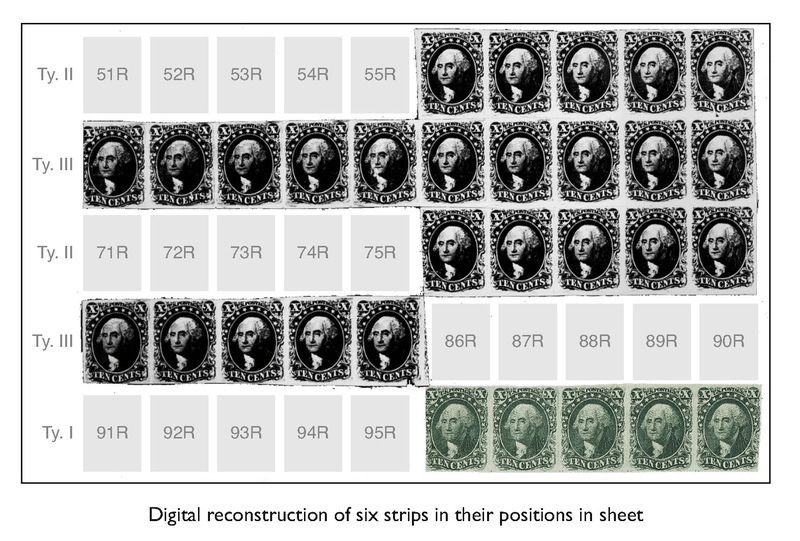 Many philatelists then and now regard the decimation of the Plate 2 pane as a wanton act of vandalism. Following their discovery, at least three were eventually acquired by Philip G. Rust, a chemical engineer by training and the husband of Eleanor Francis du Pont, a fifth generation heiress to the family fortune. On his farm in Georgia, Rust quietly formed a spectacular collection of classic U.S. stamps and covers, buying in sales throughout the 1940s, 50s and 60s. 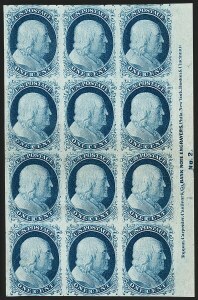 It is believed that he consigned three strips (61-65R, 76-80R and 96-100R) to the 1987 Rarities of the World sale. 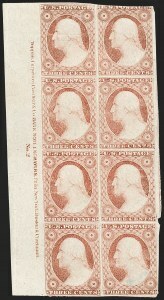 The Type I strip remained intact and was eventually sold again in the 1992 Rarities of the World sale, where it was acquired by Michael Perlman. 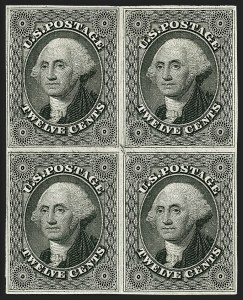 Prior to the Washington 2006 exhibition, Mr. Gross traded a cover for the strip, so it could be shown among other largest known multiples. After the Rarities sale, the strip next appeared in Louis Grunin's 1847-1869 exhibit, which won the Grand Prix National at INTERPHIL in 1976. Following the sale of Grunin's 1847-1869 off-cover material in 1976, the strip was acquired by Ryohei Ishikawa for his own 1847-1869 exhibit, which earned him three Grand Prix awards in exhibitions from 1981 to 1987. At the 1993 sale of Ishikawa's collection, Mr. 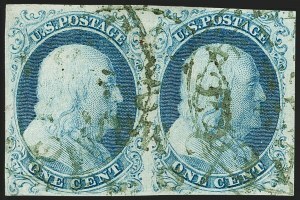 Gross captured the 10¢ 1855 strip for his own collection. 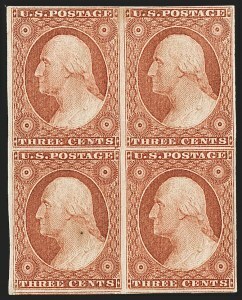 The 3¢ and 12¢ 1851 Issue are both found on Part India paper, which is a handmade silky paper that varies in thickness within the same sheet. 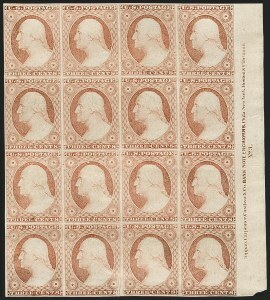 The Neinken 12¢ 1851-57 book (pp. 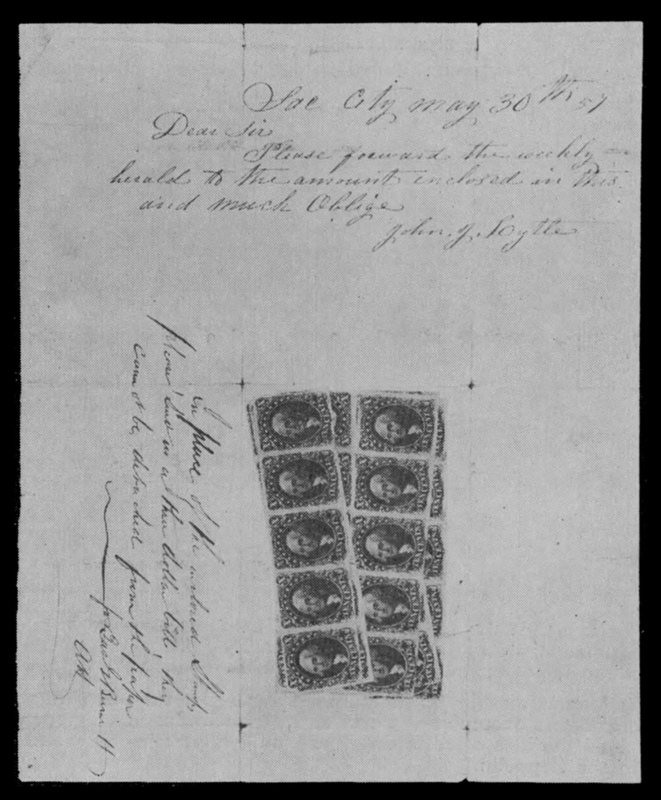 61-64) quotes from earlier publications by Ashbrook, Chase and Jaeger, which describe the look and feel of Part India stamps as "undoubtedly from the very first impressions from the Twelve Cent plate. The engravings are very sharp and resemble die proofs or plate proofs on India. The shades of both these items are of the earliest known, the distinctive grayish." 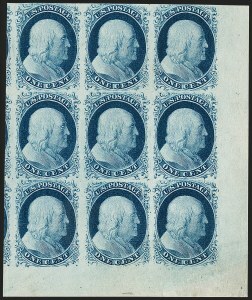 This block from Positions 64-65/74-75L1 was joined with the block of nine on Part India paper from Positions 61-63/71-73/81-83L1, which was cut up after it was last sold (Siegel Sale 989, lot 61, 2005 P.F. certificate).